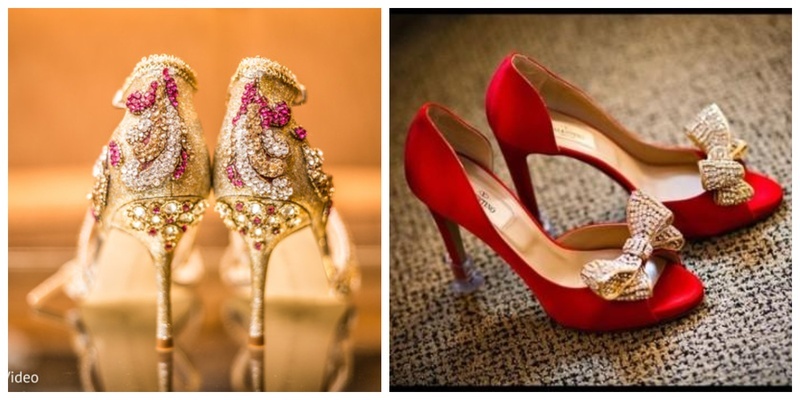 10 wedding footwear shops in Delhi NCR to buy the best shoes for your big day! After choosing your wedding outfit, if there is something that you need the most in your bridal ensemble, it is your wedding footwear. While we have made a list of lehenga shops in Delhi that will help you buy the best lehenga, here’s a list of top 10 wedding footwear shops in Delhi that will help you choose a shoe that matches your wedding outfit. These wedding footwear shops in Delhi vary from super-high end range to mid-range to suit everyone’s budget. Rest assured, all the wedding footwear showrooms listed here will help you discover the best pair to suit your style and pocket! Needledust is popular as an online shoes shopping website; but did you know that they have a beautiful store in Shahpur Jat where you can see their entire collection of bridal juttis and wedding mojdis. Needledust has beautiful wedding flats for brides who want to ditch the heels for comfortable wedding shoes. If you are not in Delhi but still want to buy wedding shoes online from Needledust, then you can shop here! Store Timings: Monday - Sunday 10.30 a.m. to 7.30 p.m. If you are a fan of bridal heels and want your wedding footwear to be as stunning as your outfit, then head to Venus Steps in South Ex. Here you will find an amazing collection of bridal footwear that is stylish as well as affordable! Store Timings: Monday - Sunday 10 a.m. to 8.15 p.m. If you are on the hunt for affordable wedding footwear in Delhi, then Stella in Karol Bagh is the perfect place to be. They have a huge selection of traditional bridal footwear with sequins and diamonds in gold and silver colours. You can even check out their bridal shoes online at Stella! Store Timings: Tuesday-Sunday 11 a.m. to 6 p.m.
Bling it like you mean it with bridal heels from Delco in Rajouri Garden. This wedding footwear shop in Delhi is a haven for brides who want to buy wedding shoes that are stylish, trendy and not overpriced. Himalaya Footwear in Chandni Chowk is another pocket-friendly option to buy wedding footwear for brides who don’t wish to spend a bomb on buying an expensive pair. What’s more? This wedding footwear shop in Chandni Chowk is close to so many street food stalls where you you can hog after shopping! Store Timings: Monday - Saturday 9.30 a.m. to 8.30 p.m. Here come the big guns of bridal footwear! The dream shoe for almost every bride, Christian Louboutin’s showroom in Delhi is the mecca of shoe lovers! Head to DLF Mall and buy the best pair of bridal shoes from Louboutin if you are all up for spending a bomb on designer wedding shoes. If you are a bride who would have wedding shoes that are not mainstream, then designer Dyuti Bansal’s handcrafted bridal shoes is something you will fall in love with. Made with the finest material and an eye for detail, Dyuti Bansal designs shoes that are a bridal keepsake you can treasure for life! Check out her entire range here! A luxury brand of high quality shoes, Oceedee is perfect for brides who wear elegance as second skin. Their range of bridal heels and bridal flats are simple, tasteful and finely crafted. Their range of wedding footwear starts from Rs. 3000, which ensures that you don’t burn a hole in your wallet while shopping for your wedding shoes! A popular choice among Delhi brides for wedding footwear shopping, The Heels located at Connaught Place is almost three decades old, and still preferred by many. It has a wide range of bridal footwear in various styles and designs that fits in all kinds of budgets. Store Timings: Monday-Sunday 10.30 a.m. to 8.30 p.m.
A shoe shop trusted by many, Stelatoes is a great place to find a good pair of wedding footwear in Delhi. They have traditional bridal heels, sandals and sequined shoes that you can buy for all your wedding functions. Store Timings: Monday-Sunday 10.30 a.m. to 9.30 p.m.
Artimen by The Shoe Garage makes bespoke shoes for men, which are ideal for grooms who want to wear something hatke on their big day! Right from stylish juttis to classy oxfords, you can get any kind of wedding shoes for men made right here! Store Timings: Monday - Sunday 10.30 a.m. to 9.30 p.m.
Now that you know where to find the perfect wedding footwear shops in Delhi, which one are you heading to for your shoe shopping?